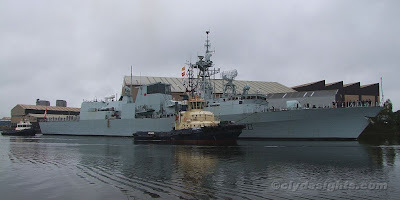 Accompanied by the tugs ANGLEGARTH and BRUISER, the Canadian frigate HALIFAX, lead ship of the eponymous class and a member of the Canadian Navy since commissioning in 1991 is seen here passing Braehead as she too headed for a short stay in King George V Dock. Like MONTREAL, she is based at Halifax and forms part of Canada's Atlantic Fleet. Her main armament consists of Mk 46 Torpedos, Sea Sparrow Surface-to-Air Missiles, Harpoon Surface-to-Surface Missiles, a 57 mm Bofors Gun, as well as a 20 mm Phalanx Close in Weapons System (CIWS). A Sea King helicopter can also be embarked.